Urbanathlon, Where You Been All My Life?! How About a Road Race? This was the first time I've ever had to defend a win! That's a whole new kind of pressure. That, and trying not to be too awestruck about sharing the podium with triathlon titans like Will Smith (Male Overall Winner) and Lauren Jensen (Female 2nd Overall). Over the years, I've watched those two dominate the Wisconsin races, beating out any level of competition, sometimes on sheer guts alone. 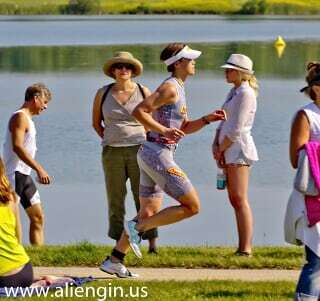 I remember the very first triathlon I ever did – on my rusty old hybrid – Lauren Jensen was the overall winner that day. True to the steely resolve she's always shown on race day, Lauren has miraculously come back from a major injury less than a year ago, to - not only participate - but again dominate, leading the women's race at Pleasant Prairie for the first 2 hours. When I spotted her with a several minute lead on me at the beginning of the run, I was both inspired and intimidated by her grit and determination. Never give up! But my confidence wavered... What if Lauren never-gives-up better than I do? The thought of going head to head with her in a finish line sprint made me immediately nauseous, so I just held my pace, and concentrated on reeling in all the positive thoughts I could grab on to. It was yet another absolutely perfect day for racing. The wind was low, the rain held off, and temps stayed comfortably in the 60s. The bike course is fairly flat and scenic, and the run course is ideal for me – flat with several switchbacks, so I can keep an eye on the competition. I'd gotten through the swim, bike and transitions relatively smoothly, so it was already qualifying as a successful day. Fatigue started to crowd its way in, and I worried that my legs might take matters into their own hands (feet?) and stop to walk without my permission. But as usual, my pace seemed to stick, in spite of lurking desires to have a quick little rest in the grass. Lauren was still some distance ahead of me, still charging forward like a machine. But there was more than a mile left to go. It was looking like it could be close. I've trailed my competition through the finish line at 5 seconds behind, at 7 seconds behind... I know exactly how impossibly far away 7 seconds looks. ...and come to think of it, Lauren couldn't be much more than 7 seconds ahead of me now. I had closed the gap. As I pulled even with her, I calculated that I had about 4 minutes until the finish line – for 4 long minutes I would have to desperately cling to first place. "Way to go" she said as I passed. However, in my oxygen deprived state, at that fearful moment that you change from predator into prey... I was certain she said "Still a long way to go" and I realized with dismay that I was already at finish line effort, and indeed – there was still a long way to go. All of my practiced self-encouragements gave way to a simple "Go, Go, Go, Go..."
As I finally approached the finish line mats, I knew I couldn't let up until I was safely across them. "And coming, through the finish line, Robin Goodell!" "Kimberly, that was Kimberly just finishing"